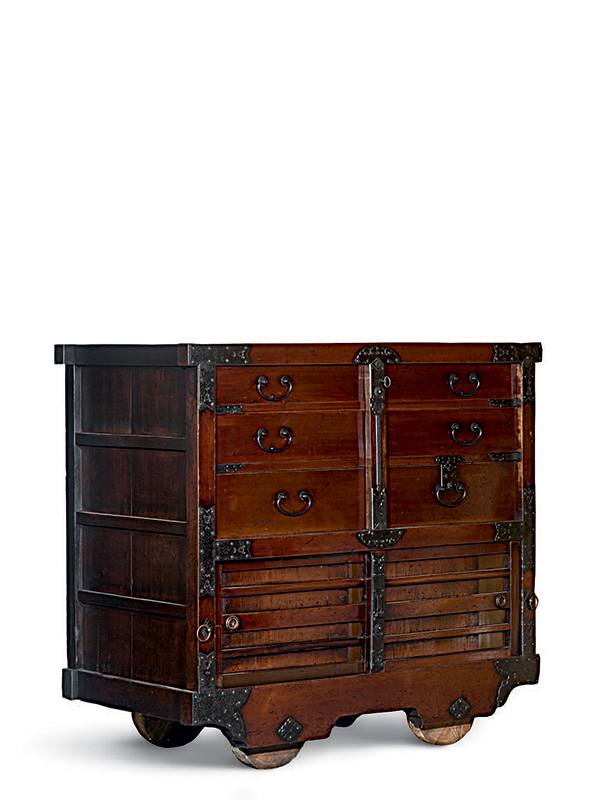 A ledger cabinet, cho­-todana, the heavy chest constructed of zelkova wood with iron mounts, handles and lock plates that are attached to the wood with small metal pins. The cabinet is slightly wider than it is tall. The top section is fitted with three long drawers with a removable vertical bar across them to lock them in place. The lower part is fitted with two sliding doors. The cabinet is placed on four wooden wheels, almost invisible as they are placed behind the bottom rail, which has been cut around the wheels to hide them. Vertical slats are fitted on all four sides, the top and bottom rail slightly extending the width of the body. Iron plaques with the same width of the sidebar are fitted to strengthen the joints on the front of the cabinet. 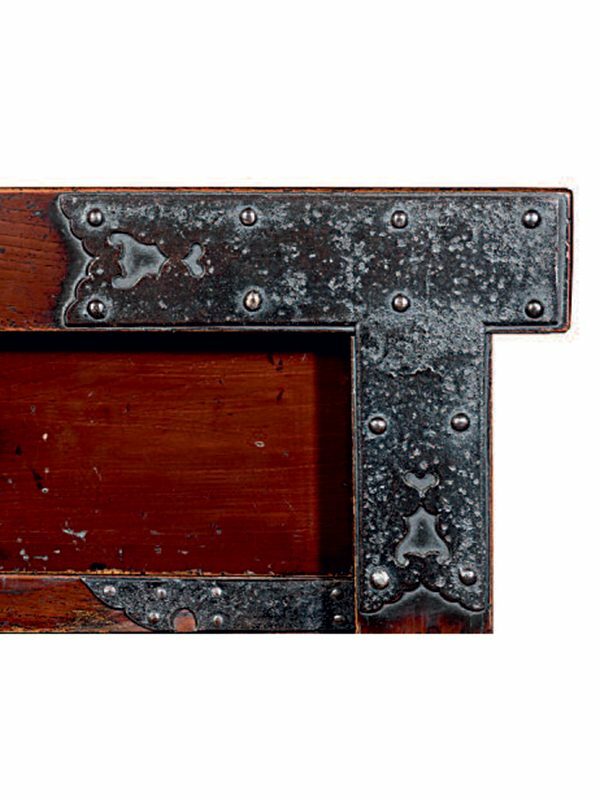 This heavy, well-­constructed ledger cabinet was used to store valuable items such as ledgers, money and seals. Cabinets of this type were located in offices and visible to customers. 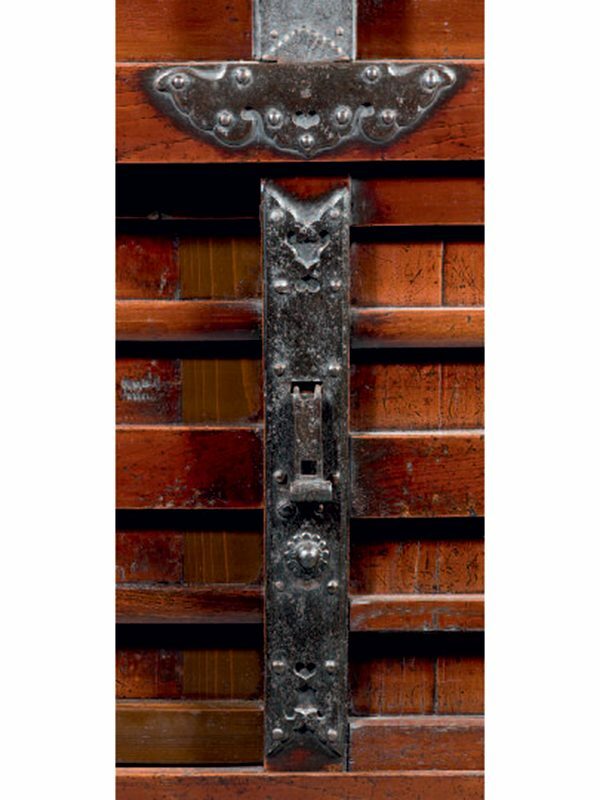 Fine wood was, therefore, used to demonstrate the wealth and status of the business. This type of wheeled cabinet is also referred to as kuruma­-todana, the small wheels fitted to speed evacuation in the event of fire. The vertical slats used are typical of the ledger cabinets made in Toyama prefecture. The top rail extending beyond the edges of the cabinet to form tsuno, or horns, is also typical of the region, as is the balanced base rail, the lower face of which is cut at an angle. A closely­-comparable cho­-todana is illustrated by Koizumi.